Our ancestral history is written in our DNA. Six British celebrities share what they discovered when their DNA was analysed and what the results mean to them. Influenced by our environment and how we adapt to it, our DNA changes through the generations. Scientists can use the differences that have built up over thousands of years to map the journeys our species took out of Africa as we populated the world. To trace their ancient ancestry, six friends of the Museum, including comedian Bill Bailey and science presenter Alice Roberts, contributed samples of their DNA to National Geographic's Genographic Project. 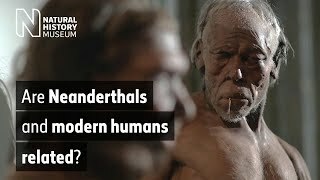 The results reveal where some of the ancestors of each person lived, as well as how much Neanderthal DNA they have inherited. Although Neanderthals eventually became extinct, some of their DNA lives on in us today. Discover how DNA is helping Museum scientists investigate human adaptation to diet and infectious disease.